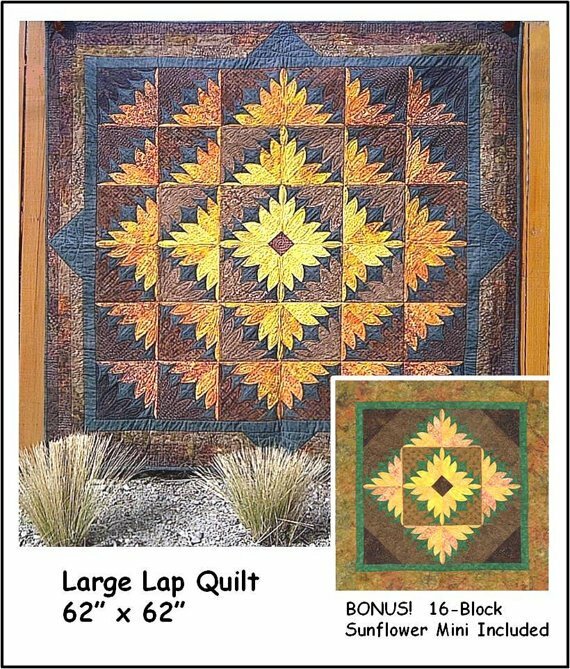 Sunflower Power is an original quilt pattern for a 62" lap quilt or a 45" Sunflower Mini wall hanging. 3D Flying Geese with rolled-back bias edges, sometimes called Cathedral curves, give each block apparent movement without any curved piecing. Make this stunning 36-block medallion-style quilt or dramatically change the look of your quilt by rearranging colours within the block and changing the block orientation as in photo #5. The wall hanging in photo #2 uses 12 Sunflower blocks and 4 half square triangles for a simpler presentation. Batiks are recommended for the gold and brown fabrics in this project.